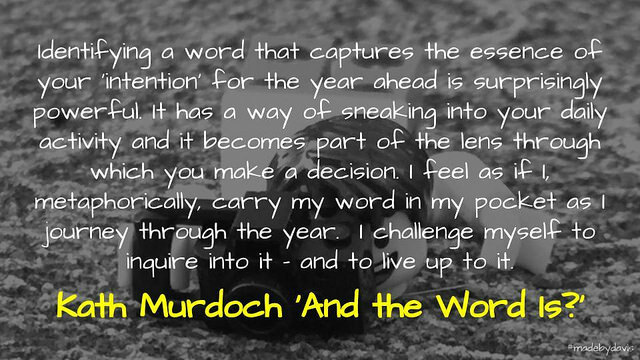 Rather than identify a lengthy list of goals or resolutions, I have, instead, chosen a word. Just one word. My family and friends have a tradition of selecting a word to bring into the new year. Just one, single word. The word provides as a kind of ‘tincture’ to the year – its purpose being to regularly nudge you along a path of your choosing – a path that strengthens you in some way. I have discussed my concern with goals elsewhere. December 18, 2018 December 18, 2018 Kind LikeTags Goals, Kath Murdoch, One Word1 Comment on 📑 And the word is?…. METAMORPHOSIS is also about letting go. It is about shedding old skins, old bodies, old habits, old values, old dreams. It is about considering what I want to take into my next decade, and what I’m willing to leave behind. I love the way in which a single word can be used to tie a bunch of desperate parts together, even more so, your words over time really tell a story. I really struggled to think of a word this year. I related to some of the points that you made about change and really liked the idea of metamorphosis. I feel like it is something that we are always doing, but not necessarily aware of or willing to give the time to.